If a Kettle Chip has a hard, firm but brittle crunch, and a regular Chip has an airy crispy snap, the stereotypical Rippled Chip has a firm break that nears the Kettle style, but a munchy mash result, like a regular Chip. 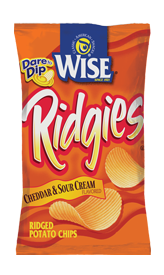 These were stereotypical Ridged Chips. These were interesting Ridged Chips. The furrows were narrow and thin. The Chips were of a variety of sizes, but mainly small to medium. The most notable aspect however was the flat shape. They were almost disc like in appearance. The gently curved dipping Chip we usually see with Ridged Chips was not apparent. There was some browning and some visible seasoning to add further character. It would be easier to list what these Chips did not include in their ingredients list concoction. The list is so extensive that it appears someone has created a flavor and then thought, 'actually it could do with a bit of that.' Then 'now, it could do with a bit of this.' And then, 'maybe a touch of this.' And so on and so forth. But does it work? Well yes actually. There is a salty cheesy potato flavor, which is pretty much what you would hope for. It wasn't too mild, but similarly there certainly wasn't anything remotely Mature English Cheddar about it.